Encounter rate is a term that I think is obvious to anyone who played a RPG. However, it might be interesting to discuss. 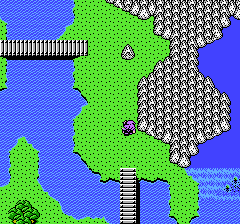 Due to being a massive connected continent, Final Fantasy II has late game enemies near early game areas. Here, one step south would have me fighting late game enemies. 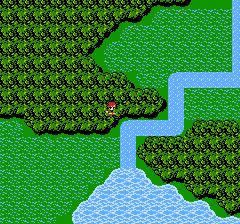 In Final Fantasy I and II (NES) there’s this idea of “spiked” chests. These chests throw you in a fight as soon as you get near them, making it feel like the monsters are fighting back against your attempts to open them. 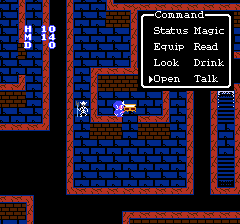 In Final Fantasy II (NES,) there’s also trap rooms. When you explore a dungeon, you enter a door, and get warped to the center of a tiny empty room (occasionally, there’s a chest, but usually there isn’t.) 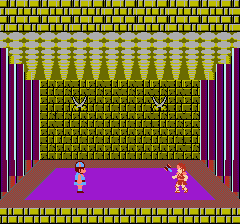 The rate of battles is a lot higher in these rooms, and because you’re in the center of the room, it’s almost impossible to get out without a fight. As best as I can tell, going north of this chest that appeared trapped me in this little room in Elysion. The skeleton to the left is an enemy that is very hard to fight at low levels. You could argue that this is kind of like a D&D game. While you don’t have really a fair idea that a door is a bad door to pick, or that the chest is guarded by monsters, you do get the sorrow of picking the wrong door, and the thrill of fighting for a chest. Unfortunately, a lot of chests in Final Fantasy I and II tend to have treasure that’s not worth your time. Due to Final Fantasy II’s battle system, the extra fights from taking the “wrong door” and the amount of “wrong doors” just feels annoying more than anything. In Dandy, the amount of visible monsters on screen means that it's hard to avoid all of them. The hero is in the upper left. Some games show monsters on screen. This is often praised by people who hate random battles. You can often escape certain fights, however, the end of these types of games tend to pile on hordes of monsters. This can get annoying if you return to an earlier area. Earthbound has a auto battle system that calculates the amount of damage from each character’s weapon, and then just ends the battle if you’d kill it in the first round. Most games don’t include this system, and you end up having big fanfares as a tiny weak enemy pounces you and dies in an instant. You can still have an “encounter rate” in a game with visible enemies. If the enemies respawn, the rate that they reappear is the encounter rate. If you have clusters of enemies that attack, the amount that you can’t dodge is the encounter rate. If you have ambushes, the amount of ambushes is the encounter rate. You do get a little more warning as to what you’re fighting in visible monster style games since they often have a sprite for the “type” of monster you’re fighting. Excluding something like the “only weak to magic” enemies in Chrono Trigger, knowing the type of enemy is usually useless. Here, I'm heading back to the second town in STED. Variability in encounter rates is interesting. In STED, for example, occasionally, you get no fights for a very long time or you may get fights constantly. Idea no Hi seems to reduce the encounter rate and even have the visible monsters flee when you hit a certain level. This can actually add to the mood of the game. For example, in Idea no Hi, after beating a boss of an area, you often get the pleasure of marching out of the area with the monsters fleeing from your approach (complete with amusing nervous twitching as they look toward you and then flee.) If you’re badly hurt, a lull in attacks can add to the tension as you’re fleeing toward town. Add in rare or dangerous random monsters, and you can imagine how a basic random battle system can be a bit exciting. In the later Wild ARMs games, you often get a method for avoiding fights or even turning off random battles. You can also break random battles in Phantasy Star II. Opening the menu, you see, resets the counter for the next battle, so you can literally walk through dungeons flipping on and off the menu to avoid almost all fights. Other games turn off random battles once you hit a certain level, or upgrade the fights after certain events. I actually loathe the turning off fights system. Fighting pointless fights is pointless, but if I want to test a spell, check out equipment, get a little more money, etc. the game prevents that. If the game upgrades fights, it may still be annoying. STED, for example, upgrades the enemies near the second town to include an enemy that looks like the weakest enemy in the game. However, this version of it can rarely destroy your spells. Since spells at that point in the game is your best way to handle certain difficult enemies and they are very expensive, this can basically give you a game over, or leave you with more tedious grinding. Some other early games upgrade enemies with the assumption you have the next tier of weaponry. This too can be frustrating. Without projectiles, you cannot win a duel in Jarvas. The game neglects to tell you this. The character on the left is the hero. All in all, an encounter rate in a game works into how the game plays. A high encounter rate, for example, can make for slow exhausting exploration. Getting mobbed by visible monsters is much the same way, and has the added fun of making small rooms look like an overly packed elevator. If the encounter rate is low, but the enemies are overpowered or annoying, the game can still be frustrating. If avoiding fights is hard in visible monster style games, then monsters that you don’t want to fight become a lot more scary and annoying. Some games try to eliminate encounter rates. They may have set amounts of visible enemies. They may strictly limit the amount of time that you can fight, or the amount of fights you have. They may make the rate of fights visible, and offer ways to avoid fights. While this can kill the tedium of random battles, this does not mean that it’s automatically better. All in all, I think it’s better to offer ways to avoid battles and to lower the encounter rates. This allows people to avoid battles if they want to, and to cut down on uninteresting fights. This also means that you don’t have fights that are ridiculously strong for the player. If the player wants to grind, they can still hunt down fights or to find a more difficult area. i’m surprised less games have implemented a system like earthbound. it would save so much time. Technically, there’s a system like that in Persona 4. The All out Attack like option allows you to quickly kill weak groups of enemies. It still isn’t as fast as Earthbound’s system.